You must make reservations at least 5 minutes in advance of the time at Enzo and Lucia. Enzo and Lucia can provide delicious food for your banquet or party and we have a Banquet Room at our Location for all of your party or banquet needs. Business meetings, groups, bridal or baby showers....whenever you need a special place for your next group gathering with great food....consider Enzo & Lucias. We have a private meeting room or rent the entire restaurant for your wedding reception, we are here to accomodate your needs. Homemade pasta is the specialty at this Long Grove Italian restaurant housed in a former Victorian-style home on the border of Arlington Heights. Begin your delicious authtentic Italian meal with bruschetta, grilled calamari or prosciutto with melon. You will enjoy the best authentic Italian food in Chicago's Northwest Suburbs. A daily risotto, fresh fish served whole and veal chops are among the hearty selections. Potato gnocchi is a popular dish. Homemade desserts include cannoli and tiramisu. The candlelit main dining room in our Italian Restaurante, located upstairs, is painted green and burgundy. Wood paneling, a fireplace, French windows and well-spaced tables make for an intimate atmosphere. The view of a fountain and flower garden spells romance. A kitchen table provides a glimpse behind the scenes. Limited outside summer seating is available. Price was not unreasonable. The noise was a touch loud but the overall atmosphere was very pleasant. Everything was great, the chicken vesuvio was made with chicken on the bone, the best! Everyone loved their food. However, they really need to learn to cook Gluten free pasta. It was penne, but it was more like shredded pasta. Flavors were good, so I didn’t want to send it back. Food and service are always amazing!! A favorite place for us to enjoy a date night or a family night out. This was our first visit to Enzo and Lucia and we ween't disappointed. Food was delicious, our server was very attentive and the ambiance was just right for double date night. Met friends for dinner on a week night. We enjoyed wine, grilled calamari & shrimp, & sausage with peppers appetizer. Main dishes were spaghetti puttanesca, chicken Marsala, chicken cacciatore & chicken franchise style. Everything was delicious. We are a book group who loves having dinner and book discussion at various restaurants. Enzo and Lucia is a perfect place for this kind of evening. Everything was great. Food, service, ambiance, etc. It is a nice dinner spot! I was happy they didn’t have music playing because the conversation levels were very loud. The food is fantastic and the entire staff, so friendly. I almost can not believe I have driven within a block of this restaurant for several years and was unaware of it. The service was wonderful with a warm and friendly staff who were incredibly knowledgeable. The food was homemade and very fresh. I enjoyed every bite! Wonderful food! We had the lamb chop special and wanted to try the halibut special, but sadly it sold out. The veal picata was delicious and the roasted vegetables were great. Fantastic desserts too! Gelato, lemon cake, and tiramisu, all delicious! Nicely priced menu and a lot of wines available by the glass. They brought us each a limoncello to celebrate our daughter’s birthday. Nice touch. It was crowded and noisy on Saturday night at 7:00 pm. We had to wait a bit for our table and the bar was jammed. There really wasn’t a good place to wait - too cold outside. We will go again during the week. Way to loud. Though they say it’s handicap accessible, it’s not. Cobblestone sidewalks makes it difficult for a walker. The lift to the eating area is a little scary. Too bad because the food was good. The food and our server were amazing!! The food is sooooo delicious ! Will absolutely return!! Great night out!! The food was lacking in flavor for the amount of money we spent. However, our server was fantastic and extremely attentive. Enzo and Lucia is hands down my favorite Italian restaurant. The staff is incredible and the food is even better. For every life milestone we go to Enzo and Lucia and have never been disappointed. Support locally owned restaurants like this one! You won't be disappointed! We (my sister-in-law and I ) went to Enzo and Lucia to have a just the 2 of us girls' (of our generation) celebration of her birthday. It was all excellent--the food, the server, and the nice table in the corner with SUN pouring in on a cold winter day. I told her that we should order wine, to celebrate her birthday, and the waiter heard me. I had neglected to mention the occasion when I reserved, but he caught the hint, and brought us a very, very yummy slice of coconut and lemon cake with a candle on it. All around, it was the perfect destination for the occasion. We do go there "just for dinner," but, I think we need to do that more often. Really, everything was delish. So amazing...every...single time! Can’t wait to go back! We love every meal we have there! The team at Enzo and Lucia is amazing...very accommodating and the food is awesome every time! Five stars across the board says it all! The ciopinnio was the best i ever had.....excellent! We are regulars here primarily because we love how Glenn and the staff treat us. The food is always very good. The new menu items we ordered this past week were excellent. Great to see the success this restaurant is having. We had a party of 8 to celebrate a birthday and had a wonderful visit. The staff was wonderful and pleasant and the food was delicious. Enzo Lucia is a fabulous restaurant to dine in. The food is authentic, tasty, delicious - outstanding food. Also that is a plus is the people who work there who make it their business to make your dining experience the best it can be and they succeed every time with their warmth, professionalism, and prompt service. I've been trying to get there for about a year and something always came up. Well worth the wait. Next time, we'll bring friends. Food was great. Thank you. We can’t say enough about Enzo and Lucia’s. We always enjoy ourselves and can’t wait to go back! Generous portions, wonderful flavor, great neighborhood spot! Easy to park, honored reservation time on a very night. Another great visit to Enzo and Lucia. They were able to take great care of our table of 13. Loved the food and wonderful how they put together some special dessert trays for us to share. The service was very good! Loved bread and garlic addition to the olive oil and cheese. Homemade ravioli was to die for. 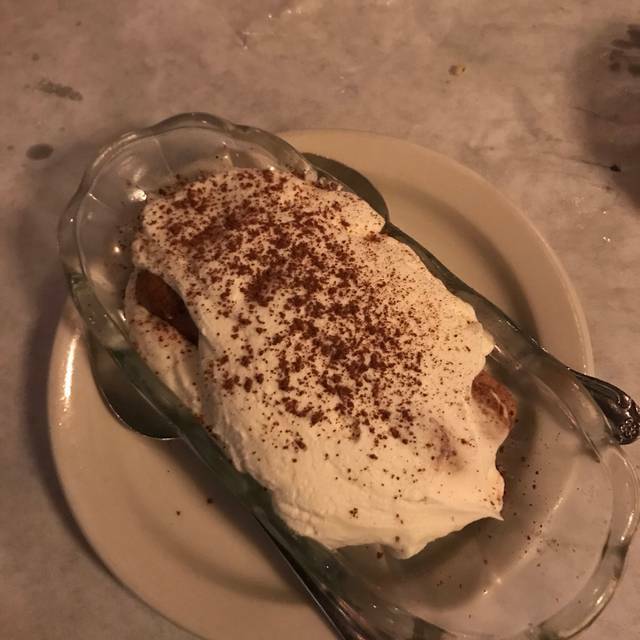 Some of the best tiramisu I've ever had. Only didn't like the sea bass, tasted fishy.